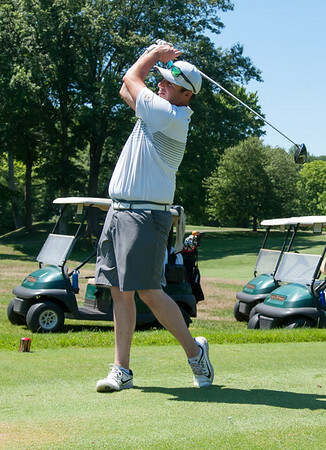 HARTFORD - Adam Rainaud excepted the winner of the Connecticut PGA Championship to come the final group he was a part of Wednesday afternoon at Keney Park Golf Course. He was right. The first-year head pro at New Canaan Country Club shot an even 70 to finish at 8-under to win the tournament, but what he didn’t expect was a final charge from Timeberlin golf professionals Marc Bayram and Geno Giancola that made the finish a little closer than anticipated. Bayram shot a 3-under 67 to finish two strokes back of Rainaud and Giancola shot a 5-under 65 for a final score of 4-under to place second and in a tie for third place respectively. Bayram birdied three of four holes midway through the round and pulled within a stroke when he birdied the 12th hole. The hot stretch also got Bayram thinking he might be able to overtake Rainaud, but too many miscues ended those hopes. “That was a good time for a birdie, but it just didn’t happen,” Bayram said. Bayram earned $3,000 for his second best showing in Connecticut Section PGA major event. A year ago, Bayram lost a late lead and then lost a playoff to Billy Downes in the Spring Stroke Play Championship, missing a chance to play in his first Travelers Championship. Though he came up three shots short, Bayram was quite satisfied with his runner-up finish after a memorable start to his day. Bayram woke up at 6 a.m. and was at the pro shop at Timberlin Golf Course in Berlin a half-hour later with his 5-year-old son, Marc, who was starting kindergarten. When the school bus picked up young Marc at Timberlin, dad did some work before heading to Keney Park. “It was a pretty amazing day for me personally,” Bayram said. Giancola, Bayram’s assistant, drove three par-4s and narrowly missed two eagles on his way to 65, the day’s low round. He and Charles Tallman each won $1,800 for the third place tie. Posted in New Britain Herald, Berlin on Thursday, 30 August 2018 18:22. Updated: Thursday, 30 August 2018 18:54.